If I continue with bullseye, I will probably be adding a 1911 .45 at some point. Reading all the hand load threads here, I slink away thinking "if I don't hand load then I should just stick with the .22!" But I don't want to take on hand loading (lack of space and time, not knowing if I will stick with it, past experience hand loading .38 spcl, etc.) nor buying a ransom rest. So I'll need to have a plan to select ammo for the learning phase of having a .45. I am looking for recommendations on what off-the shelf, reasonably priced ammo I should consider using. Another factor is wanting to minimize recoil to avoid aggravating an elbow injury. Since guns/barrels make a difference to which ammo is accurate, let's just assume a Springfield RO with the factory barrel. For matches? I'm willing to pay a bit more $/round but would prefer staying away from $150-$200 per 180 shots for a CF/.45 section of a match. Is the AMU getting in to cowboy action shooting? That would be the only reason for shooting 25-20???? The review was not by the AMU. It was from a reloading magazine. @jayhawkNavy02, I do not think I am reading the charts correctly. It appears that prior to the clamp kit, the OAL ranged from 1.84 to 1.86. And after the clamp kit was installed, the OAL range was 1.81 to 1.83. Also, on bar charts, I am not used to seeing the same value repeated multiple times on the X axis. I am having a hard time visualizing your O rings. After you survive the hurricane, would you be able to post a pic? joy2shoot wrote: @jayhawkNavy02, I do not think I am reading the charts correctly. It appears that prior to the clamp kit, the OAL ranged from 1.84 to 1.86. And after the clamp kit was installed, the OAL range was 1.81 to 1.83. Also, on bar charts, I am not used to seeing the same value repeated multiple times on the X axis. That diagram is awful. You read it absolutely right, what I should have posted is +/- .01 prior to installation, -.02 after installation. I'd love to see Cecil's post in its own thread, lots of great information, including how to polish the powder assembly that is great gouge. I measured the latest one hundred rounds I made with the CNC machined toolhead with clamp kit and Redding Competition Pro micro-adjustable bullet seating and crimp dies. The bullet is the Zero 185gr JHP using Starline brass (i.e. not mixed brass). I measured each round using digital calipers I purchased from Dillon. I was not able to reproduce the results the magazine article had. My results are as follows. The shortest OAL is 1.2095". The longest OAL is 1.2170". The average OAL is 1.2139". The difference between the shortest OAL and longest is 0.0075". The standard deviation is 0.0014". Thus, my total variation is 0.0075". The total variation in both charts is 0.02". I do not have any more pre-clamp kit .45 Auto ammo. But I do have some pre-clamp kit .357 mag loads. So I decided to measure them anyway. The bullet is a 158 gr Truncated Cone from Penn Bullets. The toolhead is OEM with no clamp but still using Redding Competition Pro micro-adjustable bullet seating and crimp dies. After measuring the first ten, I stopped because I had already reached a difference of 0.01" between the shortest OAL and longest. I didn't see the need to measure any more. Probably not a fair pre-clamp test, but it was all I had. I have enclosed a photo of where my seating stem contacts the Zero bullet in reference to Cecil's article. I am pretty happy with my Hornady Lock and load. The primer system is not great but I hear that can be a problem wth other brands as well. When using Redding dies, new Starline brass and Zero bullets my OAL variance is +/- 5 hundredths an inch. For big matches when I am shooting better I will sort my ling line ammo. 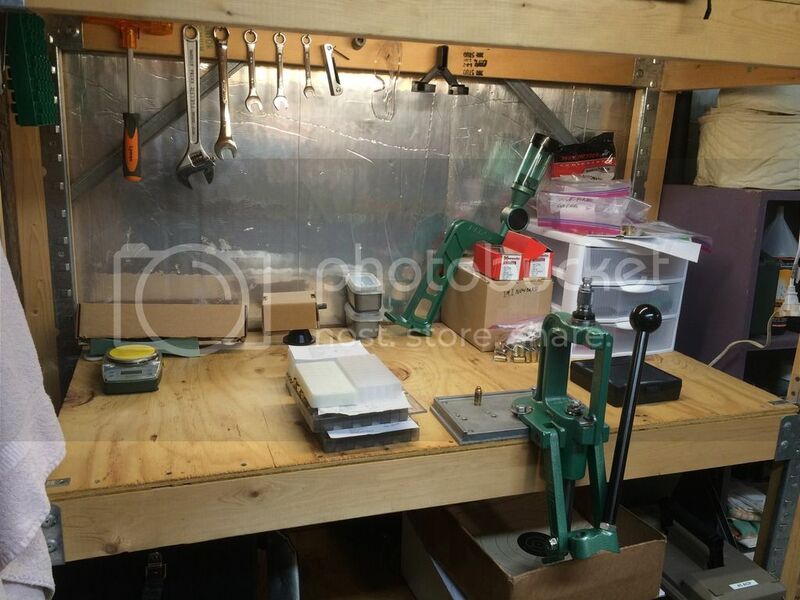 Well, I followed the prevailing advice, here is the standing reloading bench I just set up. I sit all day, so I chose to make the press at standing height. I still have a bit of organizing to do. I love the Hornady quick change die set up. the little gray tupperware kit hold the Lyman 4 die set with the quick change collars. That's an RCBS press. So how does it take the Hornady quick change setup? There is a Hornady screw in adaptor for the RCBS press with the big nut looking top. You take the big nut out. Older RCBS do not have the nut. When I get so busy that the 15 seconds needed to unscrew a die and replace it with another is important it will be time to give up reloading. Fire Escape wrote: When I get so busy that the 15 seconds needed to unscrew a die and replace it with another is important it will be time to give up reloading. Still crank your car over by hand Bruce? I have hand cranked a few vehicles and own a few bikes that are kick start only. I believe that electric start on vehicles is an improvement in general whereas adding the 'slop' of a quick change die set to save 15 seconds is not. YMMV. Well, if you are really into competition shooting, you will need to be pretty wealthy to buy factory ammo. Bad enough the way costs are going up for components. You can re-coup a bit by selling your spent cases. For .45 Auto in Bullseye, MOST guns do well with the same loads that have been used by so many for decades, so any reloading simply starts from there and you can try other loads as you want to. You don't need to re-invent the wheel and "better" loads are not generally needed. My opinion: Bullseye is 85% shooter and 13% gun. Practice ammo—dry firing is a great often-overlooked practice.